Whether as a member, partner, donor, sponsor, webinar participant, or boutique retailer or customer, there are numerous ways to get involved with The Junior League. Each one helps the organization get closer to accomplishing its goals by providing volunteer services, key resources, strategic relationships, or funding for critical initiatives. Junior League women make things happen—they form strategic partnerships, create innovative programs and raise funds for important community initiatives. They are able to do this because of the skills and experience they obtain through membership. The secret to The Junior League’s record of sustainable social reform is its ability to forge lasting partnerships with the corporations, civic groups, local officials, and service agencies in the communities where they work. Donating to The Junior League helps prepare legions of women to improve their communities with the gift of lifelong leadership. All donations are tax-deductible. The Junior League Boutique features fashion, accessories, jewelry, and objects for the home or the car. 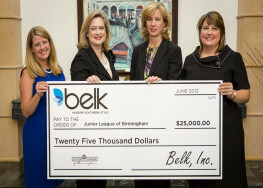 Proceeds from sales support The Junior League’s mission to train and develop women to serve as civic leaders.